Around fifteen years ago I wrote a feature called something like ‘red grapes of Bordeaux at home and abroad’. In it I mentioned a grape called Malbec, saying that although many readers wouldn’t be familiar with it, and although it was only a minor constituent in some red Bordeaux, in Argentina* it was the dominant grape. I added that, unlikely though it might seem, some Argentinian wine really was very good, and excellent value. Today neither the description nor the reassurance would be necessary; Malbec, especially Argentinian Malbec, is commonplace and deservedly popular. What else do people know about Argentinian wine? At a pinch, some might know that good Cabernet Sauvignon is made, and some other reds and blends of red grapes**, and perhaps even that the Torrontés white can be excellent. 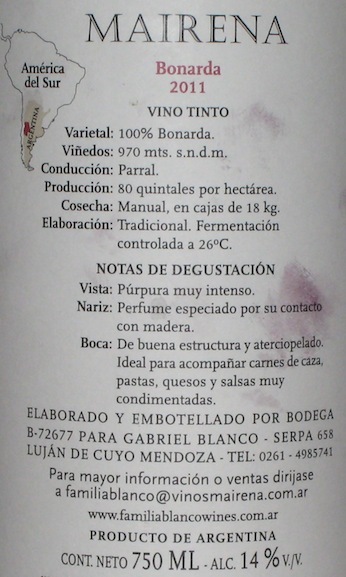 Very few would know that Bonarda is the second most grown red grape in Argentina; most people have never heard of it. It’s more obscure than Malbec was in 1999. Even the provenance of Bonarda is unclear and argued over. As far as I can work out, this is what Bonarda is (and isn’t) and where it comes from; there is still some disagreement. It isn’t Bonarda Piemontese, the now very rare Italian grape. It is Douce Noir, from Savoie in eastern France, also known as Corbeau and Charbono (in California). What is certain is that it’s best known for making easy-drinking, unpretentious table wines in Argentina, approachable but limited because of their soft tannins and low acidity. I knew a little of this before I was given a bottle, but not as much as I’d like to claim. I was given a bottle direct from Argentina, brought over in a suitcase. From what I’ve read, it’s supposed to be one of the best. Mairena Bonarda is said to show what the grape can do, how it can make serious wine. Bonarda is a popular match for spicy, meaty food, and is often recommended to go with pasta and red sauce, so I served it with a richly seasoned brisket ragu. (I pot roasted the joint in a tomato-based sauce with garlic, onions, chillies, red and green peppers, celery, olives, thyme, smoked paprika, and lots of red wine, slicing off meat and spooning it and sauce on to papardelle pasta with some fresh Parmesan.) I didn’t decant the wine as it was fairly young (2011) and Bonarda doesn’t throw much of a sediment, while I thought we’d try it just on the cool side at around 14° C (the winemaker recommends 14–16°). It isn’t a heavy wine, but it feels a big mouthful. You expect it because of the púrpura muy intenso, but it’s still surprising. There’s a lot of fruit, I would say cherry like Sangiovese and Cabernet Franc rather than the blackcurrant of, say, Cabernet Sauvignon, although it has much less acid and is otherwise very different from them. It’s lighter than Malbec and has more exotic notes, but you can see how Bonarda of this kind comes from the same Argentinian wine-making tradition, and although it felt less alcoholic, this one carried an uncharacteristic wallop at 14%. Among the spice and light oak there was something very unusual, I thought a hint of Parma violets, my fellow-drinker thought figs, possibly dried figs. I was uncertain how much I liked it for a while. My feeling was that I did, I’m still not sure how much, but that it was a mismatch with the food; the best pairing was probably with the salty Parmesan. I’d like to try it with sweet and spicy Chinese pork or duck, preferably with star anise, something to both complement and offset the exotic sweetness. Smoked or cured meats might be a good match. Some people recommend barbecued meat, sweet and smoky. It’s just about light enough to have as an unusual aperitif with, say, some salted almonds. I’d also like to drink it again Beaujolais or cellar cool, around 11° C, to see how that works. There’s a reserve wine and a Malbec–Bonarda blend that may well be more structured, have more bones and less flesh, and these are wines I’d like to drink. The Mairena winery was founded and is owned by Gabriel and Monica Blanco. During the military dictatorship in Argentina (1976–83) children’s names had to be chosen from an official registry of approved names; otherwise you couldn’t get a birth certificate. The Blancos wanted to name their eldest daughter Mairena, but it wasn’t on the register, so they named her Maria and their wine Mairena. The winery remains a family business. Read more about it here. The word on the street, the very small side street, is that Bonarda may be the next Malbec. I think it’s more likely to be the next Beaujolais. Bonarda is generally excellent value (though not yet so much in the UK, because of its rarity), drinks well young, has few chewy tannins, doesn’t have a lot of acid, and is full of fruit. It’s increasing in popularity in California, where the style of basic wine is more similar and it is already competitively priced. If other Bonardas were as sweetly exotic as the Mairena, then some British palates would have to be broken in, but in fact many of them seem to be less of a surprise. Sometimes it takes a few goes to work out how best to enjoy a new wine, while it’s said that infants require several tastings of a new food before deciding whether to like it or not. Generally I prefer more savoury and structured red wines, but I think there’s a place on my table for Bonarda and if the price comes down in the UK it could become popular as a wine with the juicy ease of Beaujolais and the more voluptuous fruit of Malbec. There is a vacant niche, if they can fill it. A good range of Mairena wines, including Bonarda, Bonarda Reserve and Malbec–Bonarda, are available from Cupari Wines, an Argentinian wine specialist in the UK. (Here’s my wine.) I haven’t shopped with them, so this isn’t an endorsement, but their website is impressive. Some of the better known online retailers seem to have Bonarda and Bonarda blends available from time to time. In Bristol, where I live, two local merchants stock Bonarda. My favourite, the ever-excellent Corks (Cotham Hill and North Street), has one pure Bonarda and one Malbec/Bonarda blend. The also excellent Averys has two pure Bonardas. 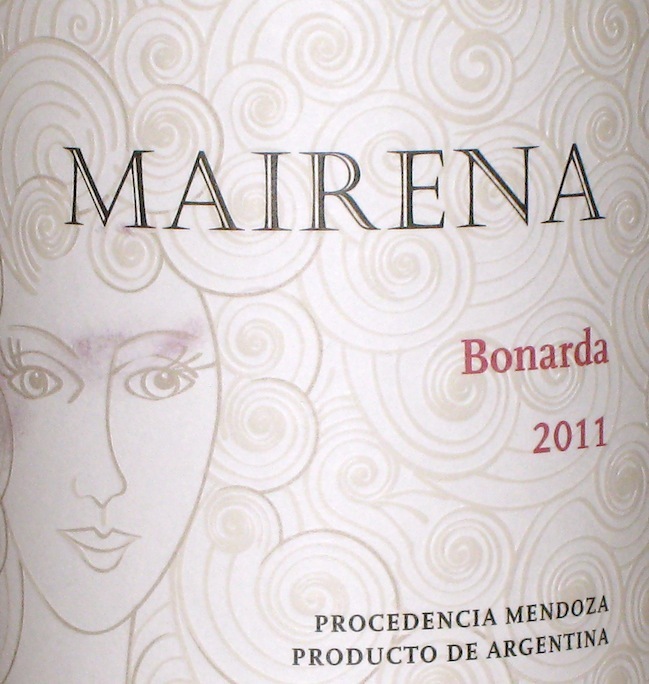 My bottle of Mairena Bonarda was bought by my benefactress during a tasting at Anuva Wines in Buenos Aires. I’m told it’s a very fine wine merchant, restaurant and tasting venue, while the website (in English) is another impressive one. Update: here’s my 2015 interview (‘All about Argentinian wine‘) with a sommelier from Anuva Wines for Alderman Lushington. * And Cahors in the south-west of France, where they make ‘black’ Malbec-based wines; some are very good. ** These red grapes are also fairly commonly grown in Argentina: Pinot Noir, Sangiovese (best known in Tuscany, e.g. Chianti, Brunello), Syrah (called Shiraz in Australia), Tempranillo (best known in Rioja) and Merlot.